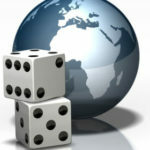 As far as trends go with something happening, it is said that one time could be by chance, two times could be a coincidence, and three times could be a legitimate pattern. Then again, it is also said that lightning doesn’t strike twice in the same place. So even doing the same thing the second time, either consecutively or in a short time frame, could be a sign that things happen repeatedly not by mistake, but by skill or a method that really works. The Cornell men’s lacrosse team has been trendy much of this season, especially recently. The Big Red has been playing some back-and-forth games of late in which they have seen their late leads evaporate in both losses and wins. This has made what has seemed at times to be sure Cornell wins interesting, before players like Max Feely, Ryan Hurley, and Ivy League Player of the Year Rob Pannell have made clutch plays to win games. 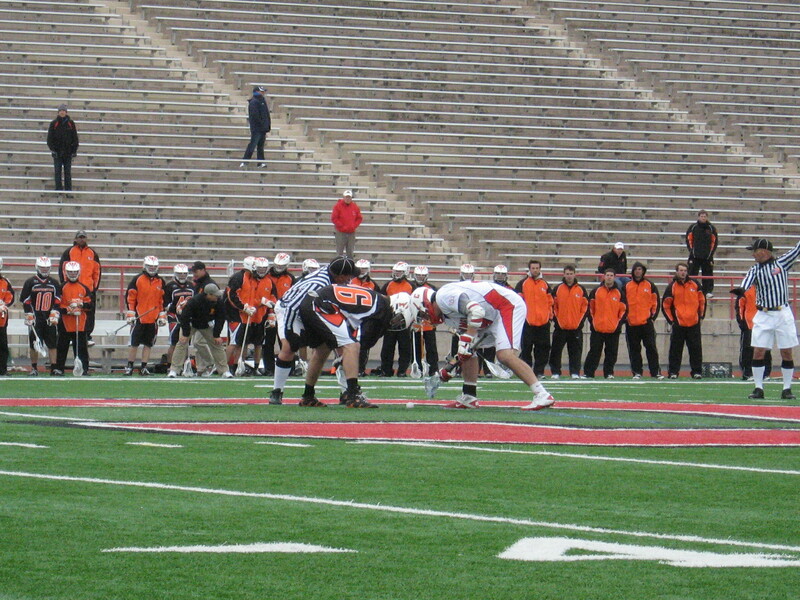 Senior midfielder Austin Boykin, shown here in a faceoff against Princeton during the Ivy League Tournament Championship Game on May 9, leads Cornell with a 56.4 percent faceoff percentage (158-for-280), this season. Army at Schoellkopf Field in Ithaca. Although Cornell won 12-11, they needed overtime to do it. The Big Red lead 11-8 with 10:56 to play in the fourth quarter. Army stormed back with three straight goals to force an 11-11 tie. Hurley scored the game-winning goal with 41 seconds left to play. Was this by chance? Especially considering Cornell has a young team this year after graduating so many key players last year. 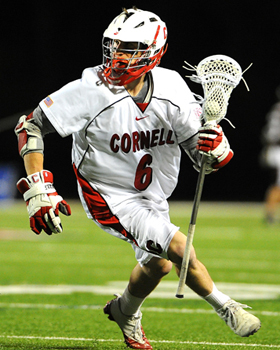 This included 2009 Tewaaraton Trophy winner Max Seibald, the aggressive midfielder who lead the Big Red with 120 shots last year. Defender Matt Moyer, who had 33 ground balls last year, was a fixture on defense and joined Seibald as a first team All-American. Midfielders John Glynn and Rocco Romero along with attack Chris Finn were also key players last year with Glynn leading Cornell with 105 ground balls. Senior goalie Jake Myers was 7-3 in 13 games. lead against Harvard and lead 11-8 with 5:57 left in the fourth quarter. The Crimson responded with four straight goals to take a 12-11 lead with 2:59 left to play. Cornell scored two straight goals in the last 2:42 to pull out a key 13-12 league win. Was this was by coincidence? In their next game on April 13, the Big Red hosted Syracuse in a rematch of last year’s national championship game won by the Orange, 10-9 in overtime. Cornell lead 7-5 with 9:11 left to play in the fourth quarter. Syracuse rallied with three straight goals to win it, the final one coming with just one second left to play. Despite the loss, this revealed a legitimate pattern of late game theatrics. Want more trendy stuff? Three other games this season confirmed late game crunch time making this concept commonplace. Freshman attack Steve Mock has been a great addition to Cornell's offense (Greg Wall, US Lacrosse Magazine). In the regular season finale on May 1 for both teams, the Big Red secured the regular season Ivy League Championship by holding off a Princeton rally. Cornell lead 9-3 with 10:49 to play in the fourth quarter. 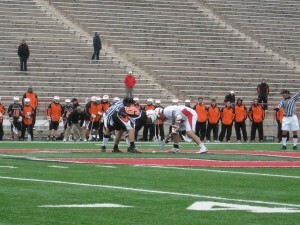 Princeton outscored the Big Red 6-1 in the fourth quarter but Cornell hung on to win 10-9. The following weekend, the inaugural Ivy League Tournament Championship was at stake on May 9. The Big Red, playing on its’ home field, lead Princeton 7-3 with 4:38 to play in the third quarter. The Tigers outscored Cornell 7-2 the rest of the game to win it in overtime, 10-9. The Big Red’s thrilling 11-10 triple overtime victory over Loyola College in the first round of the NCAA Tournament at home on May 15 was the longest game in NCAA men’s lacrosse postseason history at 69:55. Cornell lead 9-2 only to see Loyola score six straight goals to pull within 9-8 with 9:53 left in the fourth quarter. The Big Red scored next for a 10-8 lead before the Greyhounds scored two straight goals in 4:41 to force the extra sessions. Cornell junior defender Max Feely scored the game-winner with 2:05 left in the third overtime to win it. It was Feely’s first career goal which came on a clear where he took the ball coast-to-coast to score. Six games that went back-and-forth. Games that the Big Red seemed to have in control only to have to execute in the clutch to win it or attempt a comeback themselves. Cornell went 4-2 in those games with the losses coming to Syracuse and to Princeton in the tournament championship game, both by one goal. Lessons learned and plenty of clutch experience gained. Cornell raced out to an early 4-0 lead against Army and never let the Black Knights back in it during its' quarterfinal win that sent the Big Red to the Final Four (Inside Men's Lacrosse, Alex Cena). goals to put the game away far before the final minutes in a 14-5 win that needed no closing drama. Pannell had two goals and assisted on two others during the surge while Hurley scored once. Cornell had finally broken open a relatively close game. The victory sent them to the national semifinals at M&T Bank Stadium in Baltimore, Md. Thus, the Big Red arrives in Baltimore with momentum and a feeling that they can both put teams away and win in the clutch. 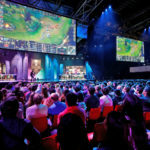 So while the later can be a nerve-wracking trend, it is one that can provide a team confidence in the fact that they have been there before. Another trend for Cornell that is not nerve-wracking is that the Big Red is in the national semifinals for the second straight year and the third time in the last four years. That is no fluke. Cornell (12-5) seeded seventh in the tourney and ranked seventh in the country in the latest United States Intercollegiate Lacrosse Association poll plays Notre Dame (9-6), ranked 20th by the USILA, today at 4 p.m. EST in one of two national semifinals in Baltimore. Virginia, the top seed in the 16-team tournament, faces Duke in an Atlantic Coast Conference battle in the second semifinal around 6:30 p.m. The winners meet Monday May 31 for the national championship. In his 10th year at the helm, Big Red head coach Jeff Tambroni is making his third trip to the NCAA semifinals in the last four years with Cornell. Tambroni has guided the Big Red to at least a share of the regular season Ivy League Championship for eight straight years dating back to 2003 with outright titles in 2005 and ’07. He brings a 109-39 record into Baltimore and currently ranks fifth in the country among active NCAA Division I head coaches with a 73.6 winning percentage. Tambroni secured his 100th career win this season with the regular season victory over Army. Cornell is 5-0 all-time against Notre Dame including 3-0 under Tambroni. The last time the two teams played was on March 3, 2007 when both teams were ranked in the top 10 and the Big Red won 13-8 at Hewlett High School on Long Island. Today’s game is the first-ever meeting in NCAA Tournament play between the two schools. A victory over the Fighting Irish would continue another trend as Cornell would remain perfect at 6-0 all-time against Notre Dame. 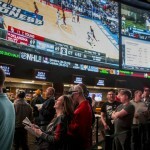 Should the Big Red beat Notre Dame and Duke defeats Virginia it will set up a Duke and Cornell matchup for the national championship. Duke beat the Big Red 12-11 in the 2007 national semifinals which were also played at M&T Bank Stadium in Baltimore. Then again, if Virginia and Cornell win today to advance to Monday’s championship it is also trendy. The Big Red beat Virginia 15-6 in the 2009 national semifinals. Virginia came into Ithaca on March 13 this year as the number one team in the country and beat Cornell 12-4, a game the Big Red never lead. Trends abound. Whichever one shows up in Baltimore for Cornell could likely determine its’ fate.